Bob Wayne makes raw, deep, ‘pure country’ music; never trying to be anything he’s not and consequently ensuring everything he does is genuine, with a total lack of affectation. He doesn’t need to try aping anyone else anyway, with his natural vocal style often having common links to artists such as the late great Johnny Cash, although when it comes to emphasising a raw deep dark story Bob may even have the edge! This is his sixth album and whilst I’m not familiar with all of his work, I reviewed the last two recordings, ‘Till the wheels fall off’ and ‘Outlaw Carnie,’ both of which I loved, although it’s true to say that right now I’m enjoying this new album even more. This recording contains twelve songs many of which follow a similar path of punked up ‘outlaw country,’ to give it some sort of reasonably accurate generic label. 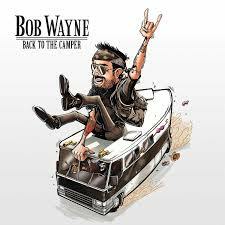 However, in the world of Bob Wayne’s music nothing is quite that simple. There are tales of rambling, running from the law, murder, mayhem and life on the road but there are also a few songs that will probably give the album a broader appeal. It is unlikely Bob will never be a ‘mainstream’ artist but that doesn’t prevent a little softening of attitude. This is still very much a ‘macho’ album but one that is always melodic, with most stories being so riveting that the listener can lose themselves in the drama’s as they unfold, but now there is also some real beauty as evidenced by the extraordinary 20 miles to Juarez on which he is joined by the beautiful vocals of Elizabeth Cook. This recording is considerably more varied than his previous two albums with some genuinely dramatic real story songs and what stories they are. Fairly obviously there is very little boy meets girl, boy loses girl. Far more likely is boy meets girl, boy murders girl, so don’t expect him to have strayed too far from his trademark darkness, in fact in some ways that darkness is deepened by the power of the stories that are portrayed on this beautifully written, arranged and produced album. For the uninitiated Bob Wayne‘s voice is deep and has a naturally dark, raw timbre in much the same way as the late great Johnny Cash. In fact some of the tragedies portrayed in the songs on occasions have a slight tongue in cheek attitude, in a similar way to mid period Cash, not to the detriment of the story, more cementing the fact that this album is designed as something to be enjoyed rather than being wary of playing it before bedtime! Whilst this album is listed as a Bob solo album his band, the ‘Outlaw Carnies’ are still very much in evidence on these twelve excellent songs, all written by Bob, with beautifully arranged instrumentation and, as usual, excellent playing that adds hugely to the evocative raw atmosphere. The earlier mentioned 20 Miles To Suarez, is a quite gorgeous straight country duet with Elizabeth Cook that starts with a lovely, almost western swing, intro before the driving bass and percussion take over, abetted by a melodic banjo and gorgeous violin and Bob’s raw but powerfully melodic vocal contrasting beautifully with the lovely femininity of Elizabeth Cook. There are banjo and violin solo’s that add an old western movie atmosphere to this graphic tale of a couple of outlaws. It is a quite stunning song that has ‘classic duet’ status as far as I’m concerned and a tale that has a broad, epic cinematic quality. On Till I Die we get into a speedy almost rockabilly mode on this country song that is full of the zest for life and the good times from the point of view of a musician outlaw! Evangeline starts life dominated by the banjo on what appears to be a slow moody story of dark tragedy but it quite suddenly picks up speed and instrumentation with the gorgeous dobro and sawing fiddle allied to a rockabilly percussion before slowing down later. It is a dark tragic tale that, again, has a cinematic quality. Showdown has an upbeat start with rolling boogie piano and fiddle counterpoint on an unusual song that thematically at least is a throwback to the old cinematic gunfighter ballads but with a raw believability rather than any sanitisation. There is an occasional gorgeous intervention from Elizabeth Cook and some tremendous fiddling and guitar playing that allied to the percussion and piano gives the song an unusual sound despite the ‘traditional’ nature of the story. I Just Got Out is a really dark murder ballad that doesn’t seem to take itself too seriously but is all the more powerful for that. It includes a tuneful electric guitar, upright bass, banjo and eventually gorgeous steel guitar on a song that varies its tempos, increasing the dramatic violent quality and sense of hopelessness. Final mention goes to Violent Side Of Me, a lighter tale amongst all the darkness and a really good song that name checks many of the classic country singer songwriters. Whilst there is a note of humour it’s still a powerful tale, with again a brilliantly arranged instrumentation that really couldn’t be bettered. I’m listening to the album again whilst writing and wishing I had written about more of its tremendous songs. It is that sort of album, with powerful evocative vocals, tremendous arrangements and playing but above all the incredibly descriptive and often harrowing lyrics allied to a raw uncompromising atmosphere that few can match; what more could you possibly want? I think it can be pretty much guaranteed that if you purchase and listen to this album you will then be forced to investigate its predecessors. And what a treat awaits you!